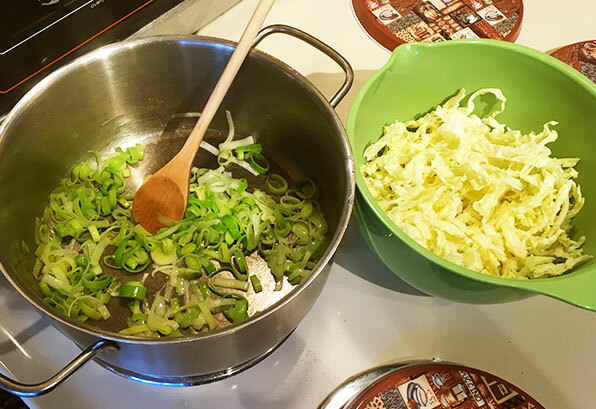 Other vegetables – I understand carrots and other veggies aren’t traditional, but I wanted to add some extra vitamins since my granddad was going to be eating it. It’s best to use a waxy potato, not a starchy one. Go for Yukon Gold or New Potatoes, not baking potatoes like Russet. This time, when I was taking pictures, I only had Russets. They absorbed a lot of the broth and started falling apart, which was fine, just a little less attractive. The recipe from Irish Central called for pork sausages, but I prefer turkey. 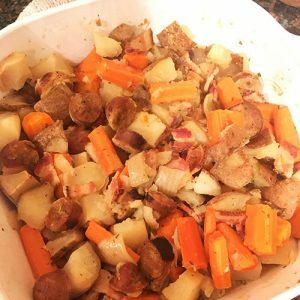 I have tried it now with a seasoned sausage and with a simple breakfast sausage, and I would say just use your favorite kind. I would also recommend using a stock that has no salt added. The bacon adds plenty of saltiness, and you can always add more seasoning later. Preheat the oven to 300 degrees F. Chop the onions and potatoes (and other vegetables you may be using) into about 1″ to 2″ pieces. You can peel the potatoes if you prefer. Fry up the bacon and sausage. Some recipes say to leave the links whole, others say to slice. Chop the bacon into bite-size pieces. Heat the stock to a simmer. Layer an oven-safe dish with onions on the bottom, then bacon, sausage, and potatoes on top. Season each layer with parsley, pepper, and salt if you wish. Pour the heated broth overtop. Cover and place in the oven for at least three hours, checking it halfway through to see if more liquid needs to be added. When I went grocery shopping for this, I was in a rush and going off of memory, and I thought there was cabbage and leeks in it. I was wrong, but I had the greens now, and I knew they’d be great with it anyway. So I sliced up the cabbage and whites of the leeks and fried them up in some butter, and served them with the coddle. This is a wonderful dish for a chilly day. You could even make some soda bread to go along with it. This is kind of like the random plates I make where I slice up potatoes, carrots, sausage and other bits – garlic salt it, fry it and paprika it and just eat it as finger food. A few good ideas for things to add, I’ve not thought of. Thanks!